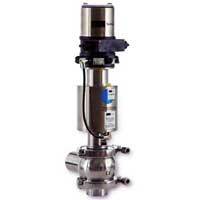 Pentair Südmo's SVP Select Control Valve range offers an extensive component solution for all common control processes in the beverage, food, dairy, and pharmaceutical industries. Its SVP standard actuator with “8692” control head (cost-effective alternative to the membrane actuator) can also be used with the optional PID-Controller in standalone operation e.g. in connection with a temperature or flow rate meter. Pentair Südmo’s SVP Select Control Valve offers many CV value options and both linear and equal percentage, which allows each application to be totally customized using our standard components.